Give nutritious meat to hungry children and families nationwide! We pay the butchering fees for deer and livestock donated by hunters and farmers. The meat is given to local food banks and ministries that feed the hungry. One deer can provide 200 meals! Wooster Hope Center - A very special thank you to Farmers and Hunters Feeding the Hungry (FHFH) for donating another 200 lbs. of venison to the Wooster Hope Center. Hebron Country Pantry - Thank you so much for your assistance paying for the processing of the steer we purchased at the fair. We have also received venison through your organization which is very well received by our clients. 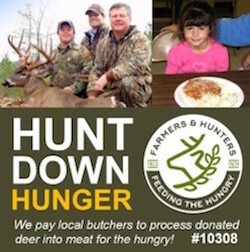 Frederick Food Bank - We were able to use the venison in our soup kitchen and provide lean, vitamin rich meat to our homeless in Frederick County who need it the most. Miriam's Kitchen - As the Executive Chef, I am grateful for the steady supply of high quality protein. A consistent supply of venison would benefit our guests and the organization greatly. Cherry Street Mission - Thanks to FHFH for their donation of nearly 10,000 POUNDS of venison! Our Head Chef Kary Jo made Venison Shepherd's Pie for dinner last night, and our guests were able to enjoy a delicious meal because of your generosity. Abba House - We are so grateful for groups like FHFH to help with our food needs. We'd like to thank all of the hunters that donated deer this season to help with our shelter. Manna Food Center - Thanks to a collaboration with FHFH we were able to fund the processing of three locally raised steer. Were it not for the support of FHFH, this quality protein would never have made it from farm to food bank.